The tent field climbs up and then slopes gently down towards the cliff-top. There’s room for around 150 tents (and the odd campervan) on a pitch-where-you-like basis. As you head up the hill, you’ll spy some secluded areas surrounded by hedges for small groups of tents, and the closer you get to the sea, the quieter and more peaceful the site becomes. Please note - Bookings are accepted for families and couples only. We do not accept same or majority gender parties. 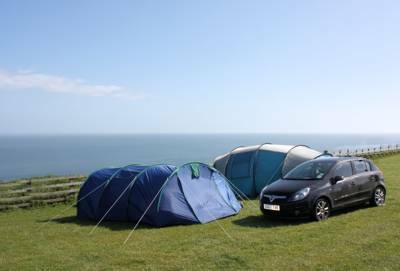 This cliff-top campsite boasts some of North Yorkshire's most breathtaking sea views. Ablutions blocks are on the main site; but there is a covered washing-up station on the camping field. A well-stocked shop joins the other facilities on the main holiday-park site, where you can refreeze cold packs and stock up on the basics. Please be advised x1 tent pitch booked only includes 1 tent. Bookings are accepted for families and couples only. Crows Nest does not accept same or majority gender parties. Crows Nest has a large tent field which accepts around 150 tents without electric hook up. There is also 20 tent pitches with electric hook up, 50 touring caravan pitches and 220 static caravans. Tents, 1 or 2 campervans, dogs – yes. Swimming pool, games room, playground... there's no denying the family-friendly functionality of this cliff-top campsite but it's the location by Gristhorpe Bay and the tumbling footpath down to the beach that make it a real winner. The North Yorkshire Coast boasts a multitude of great days out. The Cleveland Way runs along the cliff-top in front of the site and takes you into Filey (around 21/2 miles) in one direction, and Scarborough (5 miles) in the other. The restaurant at the Copper Horse (01723 862029) in Seamer has a theatrical theme and award-winning food. For great fish and chips we have a takeaway on the park or head to Inghams (01723 513320) on Belle Vue Street in Filey. From the North (Whitby) — Take the A171 road to Scarborough then join the A165 signposted to Filey. After 5 miles you will come to a roundabout with a Jet petrol station on the corner, turn left at this roundabout. We are then the second caravan park on the left. From the North (Thirsk) — Take the A170 road to Scarborough then join the B1261 to Gristhorpe. Follow this road to the end, you will come to a roundabout with a Jet petrol station on the corner, go straight on at this roundabout. We are then the second caravan park on the left. Please be aware that Touring Caravans are prohibited at Sutton Bank. From the South — Take the M18 to the M62 (east) to Howden. Follow the A164 to Bridlington, then join the A165 road to Scarborough. Two and a half miles north of Filey you will come to a roundabout with a Jet petrol station on the corner, turn right at this roundabout. We are then the second caravan park on the left. From the West — Take the A64 road to Scarborough (via York). After a series of roundabouts turn right at the roundabout with a McDonalds restaurant on the corner, follow this road until you meet the B1261. Turn right here signposted towards Filey. Follow this road to the end, you will come to a roundabout with a Jet petrol station on the corner, go straight on at this roundabout. We are then the second caravan park on the left. By Train - the nearest station is Filey, however the majority of trains to the area arrive in Scarborough. By Bus - the 120 service runs between Scarborough and Bridlington. The nearest bus stop is just at the bottom of the lane.